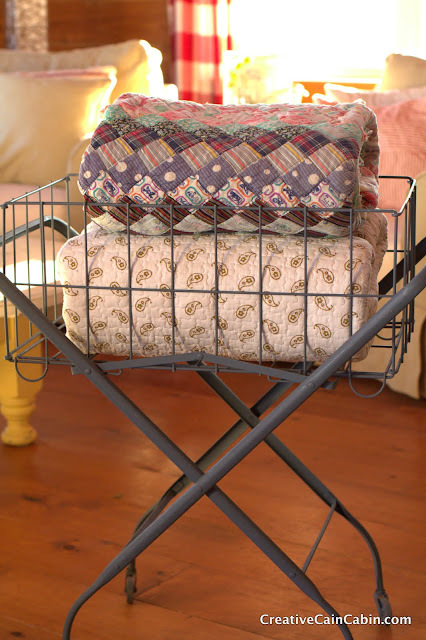 I have had a laundry cart on my list of things to find for quite some time. While out shopping thrift stores one day, I happened upon this beauty being used as display to hold other items. I immediately wanted it and asked if it was for sale. The shop owner said it wasn’t:( I asked if she would like to sell it and she said sure:) So I quickly unloaded the things she had in it and move it to my car, before anyone else asked about it. 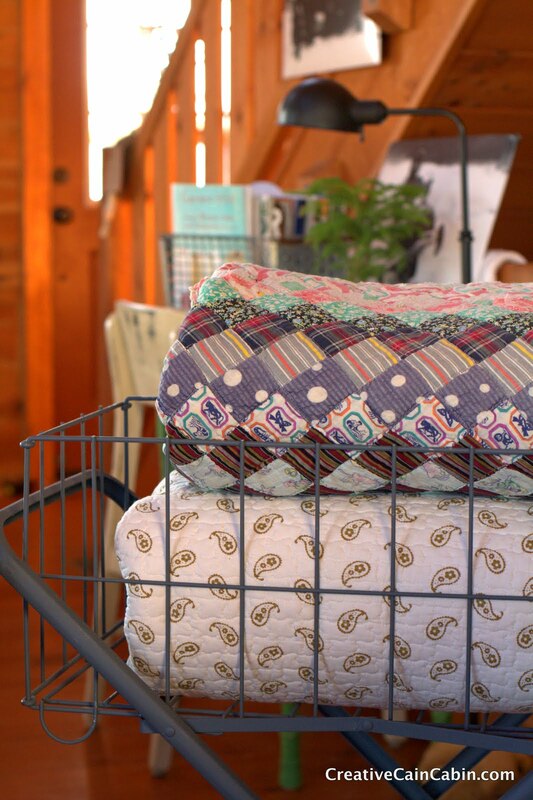 Right now I have it loaded with quilts but I can think of so many other uses for it. It’s on wheels which makes it easy to push around and the basket portion lifts right out of the frame if you want to use the two pieces separately. Oh, I love it, too. What a great find!!! You gave it the perfect job too..holding comfy quilts to keep the cabin cozy this winter..can’t wait to see what else hou have in mind for it! Love it and the pretty quilts in it! I have been looking for one too, forEVER!! Luck girl! Love it! Ohhh and the quilts too. It was sure your lucky day! look of the quilts in it. What an AWESOME find! I have wanted one of these for a long time also, Lol! 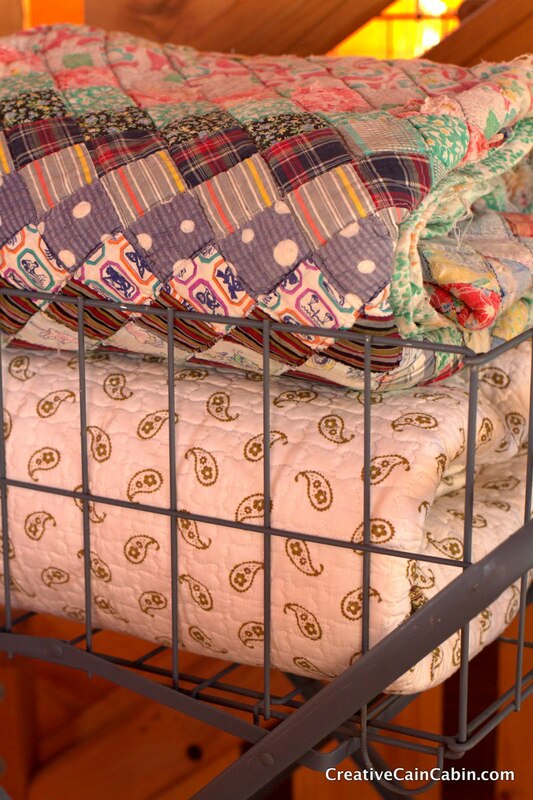 Putting quilts in there is a wonderful idea! Oh you lucky duck! :o) I have so many memories of doing laundry at the laundry mat as a little girl. My husband and I have been looking on line for an old basket like yours. :o) What a score. :o) I would have been walking at a quick pace, with it, while heading to my truck too. Lucky day indeed! It certainly paid off to ask. Love the quilts too. Lucky girl Dawn! I can see that on the porch this summer. you lucky girl, I want it! Love it! Lucky you for finding such a treasure. It is P.E.R.F.E.C.T.! just goes to show you that it never hurts to ask! congrats on such a good steal! I love it too! That was indeed a great find! What a great find! I love how you’re displaying your quilts in it too. Lovely! You were in the right place at the right time. Thanks for sharing this. Oh you were lucky to find that! Those are all the rage now. I like how you used it for your quilts. 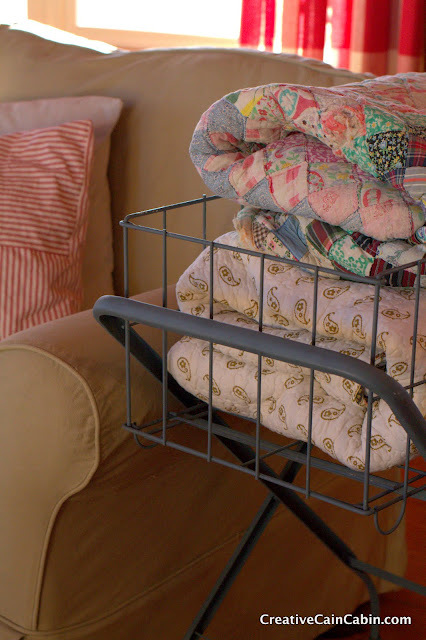 I wish I had a large laundry room and that all my bedrooms were on the main level so I could just collect clothes and roll them down the hall in one of those nifty carts. Instead, I have to lug a full hamper down a huge flight of stairs to the lower level laundry room. Yuck! Just dreaming! Great and bold find. So many uses for it too. Visiting from kIm’s. I love this such a sweet display! What a neat item! I ♥ it! I love your cart filled with your pretty quilts! I really like the quilts in it. Congratulations on your find! Ooooh, I can see why you snatched that right up, Dawn! Great find–so useful *and* pretty! That is soooo cute. I saw one of those in a model home and I wanted to take it home. That is awesome I’ve never seen one of those how perfect to put those quilts in there…also loved your desk re-do and I always love your outfits! it down the little sidewalk behind her house and hanging the clothes on the line. I did get it when she passed, but over the years it was thrown away. I will now look for another since I’ve seen your blog.